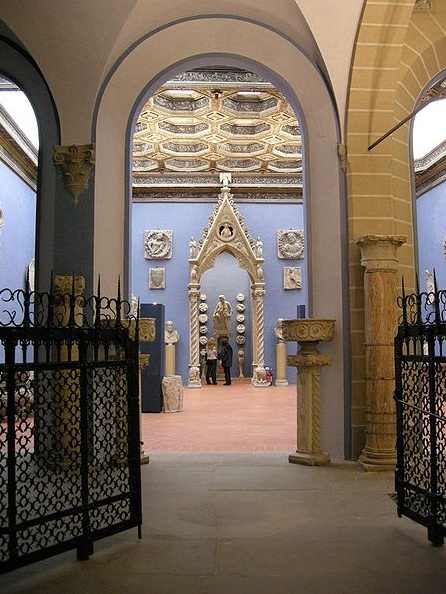 This eclectic collection of art and architectural fragments was left to the city in 1922 by the great antique dealer and Risorgimento veteran Stefano Bardini, and has recently been restored to its original appearance, including the striking (and often imitated by other museums) blue walls, that provide the perfect background to the art when Bardini ran the palazzo as an antiques showroom. Bardini built his rather lugubrious palace, re-using bits of the church and convent of San Gregorio della Pace that once stood here, along with doorways, Venetian and Tuscan coffered ceilings from the 15th-17th centuries, and stairs that he salvaged from the demolition of the Mercato Vecchio and other buildings in central Florence during the mid 19th-century Risanamento di Firenze overseen by Giuseppe Poggi. San Gregorio’s crypt came in handy to install his collection of tombs and altarpieces (there’s an especially fine one by Andrea della Robbia). Another highlight is the largest painted Crucifix in Florence, by Bernardo Daddi, which until the 1400s hung in the Duomo, and an oval spinets, one of only two in existence, by Bartolomeo Cristofori, who invented the piano in the court of the Medici. Also outstanding are Sienese sculptor Tino di Camaino’s trecento Charity; a wooden polychrome Madonna attributed to either Donatello or Nino Pisano; a panel painting of St Michael Archangel by Antonio Pollaiuolo, and a magnificent set of Persian carpets, old musical instruments, a cardinal’s hat that may have belonged to Silvio Piccolomini (the future Pius II), 15th-century papier-mâché dummies, a wooden model of Pisa Baptistry, furniture and armour. Also look for a couple of originals: the bronze 'Porcellino' from the Mercato Nuovo by Pietro Tacca and the 'Little Devil' from the Canto del Diavolo by Tacca's master, Giambologna. 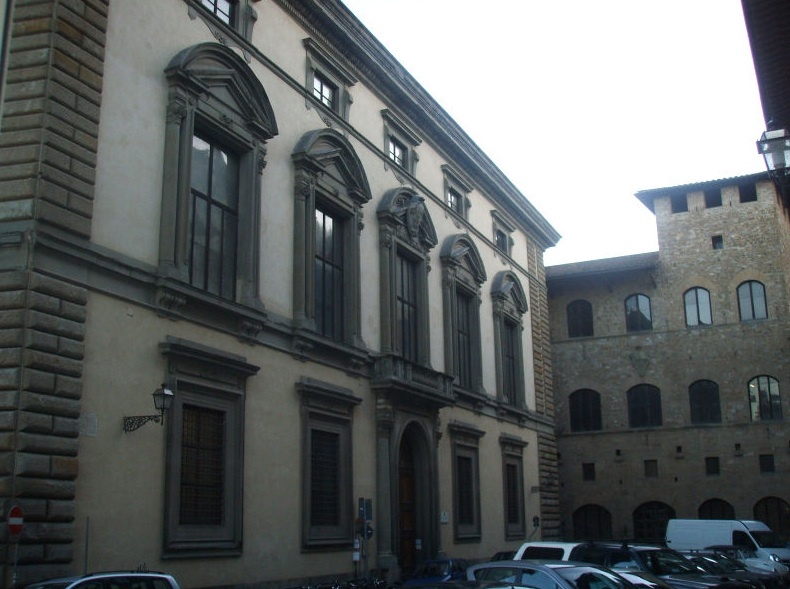 Stefano Bardini also owned the elegant Palazzo dei Mozzi which shares the piazza with the museum. One of the best surviving medieval residences in Florence, built in the 1260s by the prominent Mozzi family, it guarded the entrance to the once splendid medieval Ponte alle Grazie, which originally had seven chapels occupied by seven nuns, who one imagines spent much of their time praying that the Arno wouldn’t flood. After the war it was replaced with the current nondescript bridge. The wealthy Mozzi family were in charge of the papal treasury, and often hosted VIPs, including Pope Gregory X in 1273, who, along with Charles of Anjou and Emperor Baldwin II of Constantinople, tried to reconcile Florence's Guelphs and Ghibellines with a peace treaty that lasted all of four days before the factions were fighting again. In disgust Gregory excommunicated Florence, but not before laying the cornerstone of the church of San Gregorio (the same that Bardini used to convert into his palace). After Bardini died, his will specified that his heirs should make the Palazzo dei Mozzi into a cultural centre: now owned by the Italian State, it is currently being restored.